As the reports of the Committee on Doubling farmers’ Income—a flagship promise of Prime Minister Narendra Modi that has, of late, defined his electoral narrative—start piling up, assessing the country’s agriculture sector, the crisis gets deeper. In its seventh report, the Committee has found a systemic change in land use that has been hurting farmers’ income. According to this report, India has been diverting large tracts of productive agricultural lands for other purposes like making way for new townships and to accommodate expanding settlements besides being given for industrial purposes. This is a known story. But what the report finds disturbing is that more and more barren and uncultivable lands are being brought under farming. This has impacted the farmers’ productivity, income security and also viability of cultivation. Since 1970-71, the area under non-agriculture has increased by 10 million hectares (mha). This, the report suggests, is basically of productive agricultural lands being diverted for other uses. On the other hand during the same period (1971-2011-12), lands under the barren and uncultivated category have declined from 28.16 mha to 17.23 mha. It is more than a million hectares. 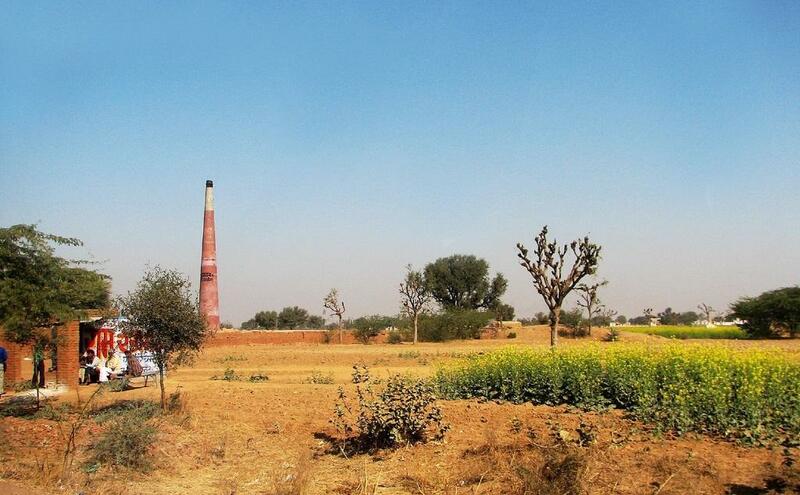 The report argues that given India’s net-cultivated area remaining the same, this indicates farmers are now more dependent on barren and uncultivable lands for survival. “The often overlooked fact behind the almost stagnant net-cultivated area is a significant diversion of prime agricultural lands for non-agricultural purposes and the simultaneous induction of barren and uncultivable lands. An apparent logic behind this statement is that the expansion of cities and towns and other developmental/infrastructural activities often take place in prime agricultural lands around cities/townships,” says the report. 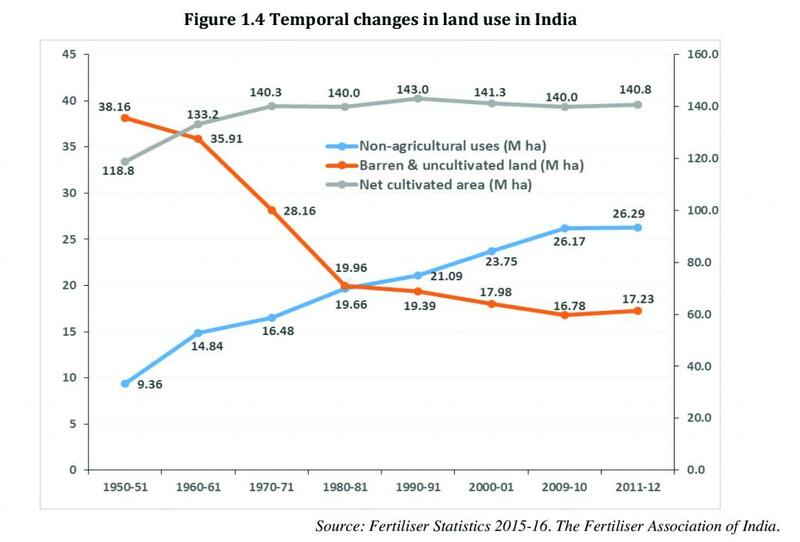 India’s net-cultivated areas remain stagnant at around 140 mha since 1970. But lands under non-agricultural purposes have gone up from 19.66 mha in 1970 to 26.19 in 2011-12. In the decade of 2000-2010 alone, India has added close to 3 mha in this category. On the other hand, lands under the barren and uncultivated category, has come down from 28.16 mha in 1971 to 17.23 mha in 2012. In the decade of 2000-2010, it saw a dip from 18 to 17.23 mha. In both the above categories, land use changes have followed complimentary trends. More importantly, this tract of new lands is going to decide India’s self-sufficiency in food production. Most of these lands are rain-fed. The government’s ambition of doubling farmers’ income faces a big challenge here. “As new lands inducted to croplands are extremely poor in terms of fertility status and overall health, a careful monitoring and management is obviously needed to make them productive and economically remunerative,” says the report. There is nothing wrong to convert large track of land into new Townships.There is a need to develop new township to accomodate growing population.Townships must be planned and green area norms to be maintained at all costs.Each house to have fruit trees and zero water waste management must be ensured in each township.If we do not develop Mega Townships then number of unauthorised colonies will mushroom and pollute the complete envirinment.Development must come up like Chandigarh.Smart city concept to be followed.Smart cities to be developed based on the requirement and area specific.